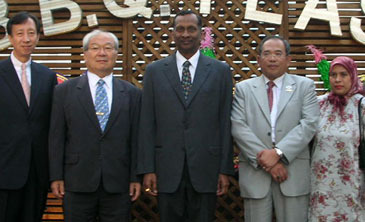 Malaysian Ambassador to Seoul Dato' M. Santhananaban (center) poses with MTPB Director Abdul Mutalib Awang (2nd from right), Holiday Inn Seoul l President Lee Chong-Kyu (2nd from left), and General Manager Park Hun-Sung (left). At right is Mrs. Awang. Director Abdul Mutalib Awang of Malaysia Tourism Promotion Board (MTPB)'s Seoul office hosted an event for Malaysian Food Promotion at Holiday Inn Seoul's Garden Land on May 29, 2006. 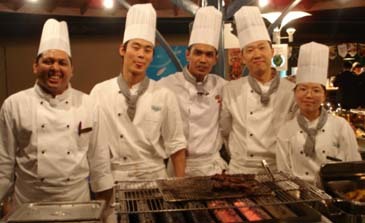 Malaysian Food Promotion, which started on May 22, 2006, runs until June 30, 2006. The evening event was joined by over 200 guests from the local tourism industry and other fields. The event was co-hosted by the Holiday Inn Seoul hotel. Among the VIP guests were Malaysian Ambassador to Seoul Dato' M. Santhananaban; S. J. Lee, assistant general manager of the Korea Air; Shin Yong-Jin, sales manager Korea of Malaysia Airlines; Joseph Joh, managing editor of The Seoul Times. From the Holiday Inn Seoul hotel President Lee Chong-Kyu, and General Manager Park Hun-Sung took part in the event, mingling with other VIP guests. Malaysian Ambassador to Seoul Dato' M. Santhananaban delivered a congratulatory speech before the start of the event. 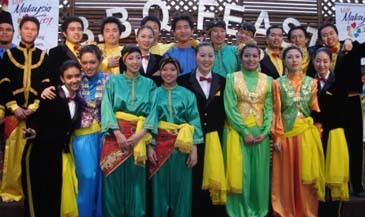 Malaysian singers and dancers in traditional costume added special flavor to the festival of authentic Malaysian cuisine. For this food festival 39-year-old chief chef Ramlan Bin Jaafar and 25-year-old chef Mohd Shamsul B. Samsudin flew in from Holiday Inn Resort Penang, Malaysia. For the outdoor BBQ Feast, Malaysian satay of small-marinated cubes of meat, fish or poultry, and two kinds of hot menus and two cold menus of traditional Malaysian dishes were presented. Traditional Malaysian food is characterized by various tastes and styles coming from the harmonious recipes of China, the Netherlands, and United Kingdom, which influenced Malaysia in the past, according to MTPB officials. Visitors can taste both authentic Malaysian food and culture at Garden Land on the fourth floor of the hotel in Dowha-dong, Mapo-gu, Seoul. Traditional Malaysian performances are available from 7:30 and 8 p.m. on May 29, June 2, June 3, June 9, June 10, and June 30, 2006, respectively. Waiting for the customers of Malaysian Food Promotion are two Seoul-Penang tickets from Korean Air, three accommodation tickets and 20 BBQ coupons offered from Holiday Inn Seoul. Also offered through the luck draw are 10 cakes, 10 T-shirts and 10 traditional Malaysian robes of Batik Sarung. Malaysian government declared the year 2007 as the year "Visit Malaysia 2007" in its national drive to promote tourism particularly among the Asian nations. Malaysian Tourism Minister Datuk Seri Tengku Adnan Tengku Mansor hoped that world's travelers could choose Malaysia as their favorite tourism spot, according to MTPB's Seoul Office.